Herbal teas and botanical infusions (sometimes called tisanes) can provide a variety of health benefits. Different types of herbal teas have different properties like antioxidant, tonic, sedative, stimulant, and calmative. Herbal teas are one of the easiest, cheapest, and fastest ways to use natural herbs. Place herb into a reuseable teabag, use a tea ball strainer, or brew one huge pot. If you have further questions, use the contact form below to contact us. Below are some of the most commonly asked questions about botanical teas and herbal infusions. If your question is not answered, please contact us using the form at the bottom of the page. 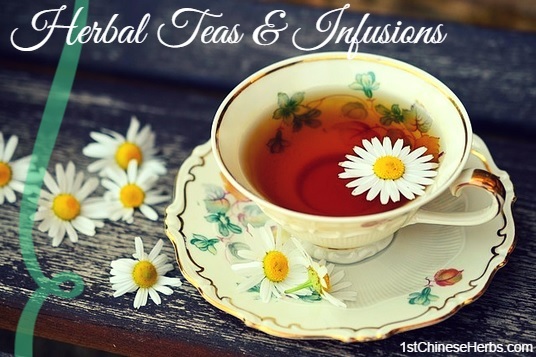 What are the differences between herbal teas and infusions? Botanical infusions are steeped much longer than normal teas and with an increased quantity of natural herbs. They are sort of like super-teas and are also quite easy to make. The quantity of minerals and herbs found in herbal infusions can be many times greater than in normal teas. When should I use an herbal infusion instead of herbal tea? In general, people who are ill use herbal infusions instead of teas in order to get extra herb content, vitamins, and minerals to beat their cold, flu, or other illness. However, there are many people drink herbal infusions every day with few (if any) adverse effects. Check out our How to Brew a Flawless Cup of Tea page to see our suggestions on how to brew herbal teas. Bae J, Kim J, Choue R, Lim H. Fennel (Foeniculum vulgare) and Fenugreek (Trigonella foenum-graecum) Tea Drinking Suppresses Subjective Short-term Appetite in Overweight Women. Clin Nutr Res. 2015 Jul;4(3):168-74. doi: 10.7762/cnr.2015.4.3.168. Epub 2015 Jul 31. PubMed PMID: 26251835; PubMed Central PMCID: PMC4525133. Bahmani M, Eftekhari Z, Saki K, Fazeli-Moghadam E, Jelodari M, Rafieian-Kopaei M. Obesity Phytotherapy: Review of Native Herbs Used in Traditional Medicine for Obesity. J Evid Based Complementary Altern Med. 2015 Aug 12. pii: 2156587215599105. [Epub ahead of print] PubMed PMID: 26269377. Ernst E, Pittler MH. Efficacy of ginger for nausea and vomiting: a systematic review of randomized clinical trials. Br J Anaesth. 2000 Mar;84(3):367-71. Review. PubMed PMID: 10793599. He RR, Chen L, Lin BH, Matsui Y, Yao XS, Kurihara H. Beneficial effects of oolong tea consumption on diet-induced overweight and obese subjects. Chin J Integr Med. 2009 Feb;15(1):34-41. doi: 10.1007/s11655-009-0034-8. Epub 2009 Mar 7. PubMed PMID: 19271168. Khan SS, Najam R, Anser H, Riaz B, Alam N. Chamomile tea: herbal hypoglycemic alternative for conventional medicine. Pak J Pharm Sci. 2014 Sep;27(5 Spec no):1509-14. PubMed PMID: 25176245. Zhang X, Wu Z, Weng P. Antioxidant and hepatoprotective effect of (-)-epigallocatechin 3-O-(3-O-methyl) gallate (EGCG3″Me) from Chinese oolong tea. J Agric Food Chem. 2014 Oct 15;62(41):10046-54. doi: 10.1021/jf5016335. Epub 2014 Oct 6. PubMed PMID: 25259858.